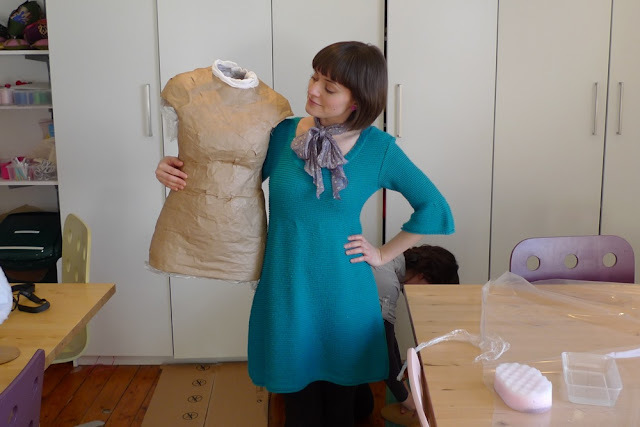 Today Oh Sew Brixton held an experimental dress form crafting workshop. 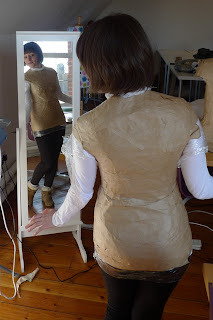 Being desperate for a dress form but reluctant to fork out hundreds of pounds, I leapt at the chance to make a replica of my torso using nothing but brown paper tape, some cling film, a wet sponge and a trusty helper. 1) While a dress form fashioned from duct tape has a smoother and more professional-looking aesthetic, as soon as it's cut off the body it's going to collapse. Parcel tape may be the ugly duckling method, but it's reliably sturdy. 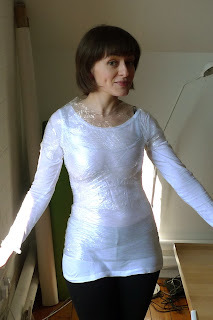 2) Wrap yourself in cling film first - not only will it save you cutting up a t-shirt, but it makes the experience of being covered in wet paper relatively more pleasant. 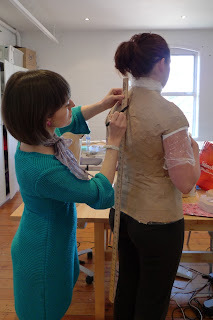 3) Start by wrapping long strips under the bust line and round the waist, then diagonally across the bust and shoulder blades, then smaller strips round shapely lady parts, and some strips diagonally around the hips (bias cut stylee). 4) Apply three layers of tape and try to be systematic about it so you know how many layers you're up to (I did mine a bit too willy nilly). 5) Don't forget to go to the loo before you start getting wrapped! 6) Don't drench the tape in too much water (unlike moi) and, when you've finished, use a hair dryer to blow dry it until you can blow dry no more - if you take the form off while it's still even slightly damp, it'll start to subside. 7) Draw a line down the middle of the back as a guide line for cutting it off, and draw markings at the shoulder blades and waist to guide you when joining it together again. Once we'd cut the dress forms off, we taped up the cut with duct tape. Then we drew around the bottom edge onto cardboard to make a base. That's as far as I got with my clone today - I've still got to stuff it (probably with pillow foam), smooth over the surface (possibly with PVA glue, although I'm not sure I'll be able to pin through that), find a suitable stand (I'm thinking a small stool), and eventually stitch a cover (hopefully out of felt). If you've got any suggestions of the best way to finish it off, I'd be glad to hear them!